Very cool. I have several friends who totally hold by utilizing Igros Kodesh. Certainly in White Russia there was no hakpoda in combining names of the rebbes. Many Chabad people were called Zalman Mendel, Zalman Duber etc. Take a look in Sefer Hatzezaim and even there you will see examples of what I refer to. Check the memorial book to my faher's town Kurenitz and most people carried 2 names of Chabad rebbes or other Chassidic leaders like the Berdichever or the Besht.Perhaps in today's Chabad its not done. Actually why go the Igros, why not get advice MiPi HaGevurah from the Torah itself. We have the Goral haGera which works that way. I don't recall Reb Yeruchem or Reb Elchonon doing a gorel with the Nefesh hachaim! 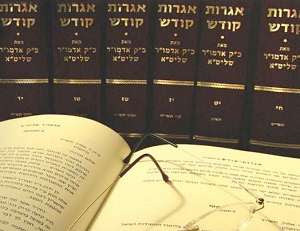 In addiiton there are other similiar methods in order to obtain guidance from the Torah itself. Personally I have no problem with people getting advise from the Igros, on matters like names, buying a wonderful home in Miami Beach or doing a good shidduch, but the Chabad Rebbe was always a nasi hador . In terms of Klal this method is close to absurd. Would we adopt positions on Israel, teritories peace strategies etc based on the Igros. We already know Dor dor vedorshav... each generation has a new nasi to meet the needs of the times new realities and new conditions. I know - the hakpoda against naming is something that the Rebbe spoke about, but in earlier generations (like we've spoken about in the past) people were less into hakpados in Chabad. I'm fine with people who would like to use Gorel HaGra isntead, or any sefer for that matter. I believe that Reb Nachman of Breslev suggests using a holy sefer as a source of guidance in this way when one doesn't have another reliable eitzah: see Sefer HaMidos, inyan "Daas." Sefer HaMiddos, Daas 14: "When a person wants to know how to proceed in a particular situation, let him open a holy book and he will understand what to do." Forgive me for intruding to make a comment. I have not used the Igros Kodesh in this manner, but for a period of time I did open a Tanakh at "random" for guidance. I know that every pasuk in Tanakh is full of very important meaning, that can inspire and instruct me, as an individual, and also all of us. When seeking guidance from the Eybershter, I could certainly turn to the week's parsha, to the week's haftarah, to Tehillim, or to some other chapter that I think will help me. But of course in that case, if I choose, then who is helping whom? Opening the Tanakh at random enables the selection to be made by other than myself. If I believe in hashgacha protis, then I know that the pasuk that is found by chance, is the one intended by Hashem. If someone doesn't believe in hashgacha protis, then they may see this as allowing an aleatory process to shed light on the issue in an unanticipated way. The purpose is not divination, in the sense of predicting the future or allowing unknown forces or entities to direct us, but rather the purpose is to gain an outside-the-box understanding of something. As usual, I completely agree with you. Be careful before you apply a label of divination without studying it first! I see looking at the Igros as a way of seeing some of the Rebbe's Torah advice. In fact this is one of the ways the custom originated. A rav who used to study 5 letters a day, saw amazing hashgocho in the way the advice applied to his rabbanus. He spoke about it, and other people also started seeing the hashgocha protis. Someone who uses the Igros a lot is someone who becomes very familiar with the Rebbe's approach to different problems and issues. Without intending to put the Igros ahead, I think that it's much clearer than Goral haGra, because it's extremely specific, much easier to interpret than a possuk. And the custom is *not* to rely on one's own interpretation, but to enlist the aid of a mashpia/or rav. This happened to me recently, when I showed it to my mashpia. She wanted to ask a rav, and he said he wouldn't look at it until I provided more information. This rav would use the igros, but not before looking at the issue from a purely practical angle. (It wasn't a halachic question, it was a shidduch question). Actually I know a Shaliach who inserts his letter in a page of the Igros Kodesh but does not read the content of the page. Which means that he uses it as a way to convey a message but does not try to find an answer in a letter which was not meant for him. Please would you tell the Shaliach to stop doing this. He should open the Chumash instead. And in there - he will see the Words of Hashem, the Living G-d, in the Torah. The words of the Torah are eternal, for all time. More specifically, the Shaliach should re-open the Parsha of the week. Because we live through the Parsha of each week. And the Parsha of the week will contain words of direct significance to him. He should think about what he is reading. And from those Divine words, he will be elevated, and derive inspiration. He will be strengthened in his Emunah and activities for his daily life. What do we say every morning? "Modeh ani lefanecha, Melech, Chai, Vekayam...."
"I give thanks before You, LIVING and everlasting KING....". Hashem is our Living King. And so we must look at His words of Life - which are to be found in His Torah. If you don't want to use the Igros-then don't. Nobody is forcing you. However, to say that it's ossur is just plain nonsense. There are sources in the gemara for placing letters into seforim. It's an established part of Judaism! I'm sure you can find (even today) anti-Chabad Rabbonim who might say it's ossur, but also you can non-Lubavitcher Rabbonim who say it's muter. Your opinion that is ossur is fine but it's only your opinion, but be aware that there are plenty of legitimate Rabbonim who hold it's mutar. I don't know if they are in the majority or minority but halacha works by the opinion of different poskim as you may know.